QED Original MkII Biwire is a biwirable version of QED Original MkII, a fantastic low cost, high performance solution to biwire hi-fi or home cinema speakers - price includes free UK delivery and QED's lifetime warranty. 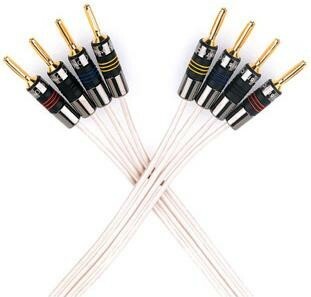 QED Original MkII Biwire is a genuine low impedance design with minimal signal leakage, its low density polyethylene dielectric, 99.999% oxygen free copper conductors and optimised geometry substantially reduce conductor interaction and signal distortion, all resulting in superb sound quality for such a low cost cable. Supplied unterminated (bare wire). You can also order QED Termination Service, for which we use high quality QED Airloc plugs as shown in the photo above. (If you order 4m, and order termination, we will terminate 2 x 2m lengths, if you order 10m, we will terminate 2 x 5m lengths, and so on). If you have several cables you need terminated or prefer to discuss termination on the phone, you can call to order on 0121 224 7300.